Description: Brand new ES44ACs 5742 and 5740 run light past Main Street Station. Description: Empty coal train heading west along Southern Ave. Description: A southbound BNSF coal train approaches the signal called by NS engineers as Dairy Barn. Description: A loaded coal train heads south through Colorado Springs. Description: Three BNSF Engines parked at BNSF's East Thomas Yard in Birmingham, AL. 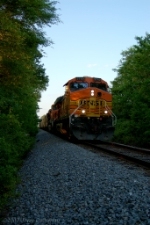 Description: Some BNSF power sitting at BNSF East Thomas Yard in East Thomas, AL. Description: A UP chemical train and BNSF empty coal train both wait for pemission to cross the Tower 55 interlocker. Description: Sorry for the blurriness.